"The sizes may range and the colors may change, but one thing is for certain: subway tile is a classic in the kitchen. They were first popularized in the 1900s after the NY subway used the 3" x 6" glazed ceramic to line the walls floor-to-ceiling high. They were used for their non-porous, reflective, easy to clean, sanitary purposes. After that they were a staple in homes and applauded for their heat-resistant and waterproof qualities. Today, they are just as regarded and fashionable as ever. The finish options and color choices have increased to accommodate almost any palette. Like any marveled fashion icon, subway tile is here for the long run.” Joni Spear, Joni Spear Interior Design. “Classic. Subway tiles are clean, simple and provide a nice backdrop to a punch of color. This tile crosses all design aesthetics from modern to traditional and everything in between.” Trisha Curtis, Sunderland Brothers Company. “Classic. All you have to do is look at pictures from historic homes or go tour a few that have original tile and it is undeniable - it's classic. It will be reworked/made in different material, perhaps even laid differently. It may go in and out of fashion as trends in design change, but it will always be a classic.” David Schneider, ASID, Green A.P. “Without a doubt subway tile is a classic look. There aren’t many experiences related to a subway that people want to relive in their homes, but this look and style of this classic wall tile is here to stay.” Mitch Tully, Trends in Tile. “Subway tile- it's a classic! While personally, I'm getting a bit weary of seeing the same 3" x 6" white glossy tiles with gray grout, incorporating the different sized tiles in a unique pattern such as herringbone or running 2" x 4" subway tiles vertically can add a twist to the traditional 3" x 6" horizontal layout. Or, mixing it up with a 2" x 4" or an oversized subway tile can also be interesting. I would love to see a backsplash done with subway tile in fun colors, such as a pool blue or a mix of neutral shades like gray, tan and cream. As long as the backsplash colors complement the hues in the countertops, it's a great way to bring color into the kitchen. Certainly it seems that subway tile is here to stay, it's just up to us designers to mix up the installation method and pattern!” Emily Koch, JCR Design Group. “Subway tile is definitely a classic! With so many sizes, colors and patterns to use with subway it is here to stay as it always has been through the decades of design. 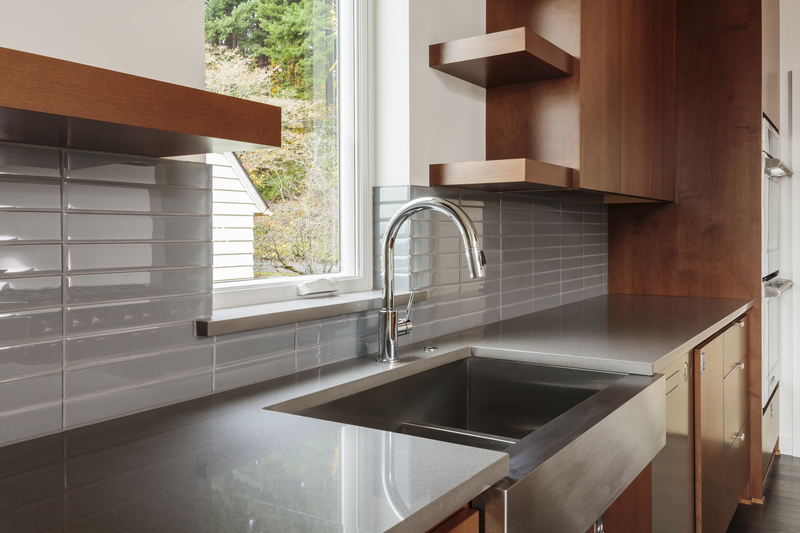 The clean lines of subway are replacing the glass tiles that have been so popular and are now fading from our customers wish lists for their kitchen or bath.” Julie Baum, BaumHouse design. “I don’t believe that subway tile in the kitchen will ever appear outdated. It has a classic, clean look that fits into any traditional or contemporary style kitchen. What else can make a granite countertop with beautiful veining pop and equally blend so well with the clean look of a neutral countertop? A classic subway tile backsplash can pull it all together to create a beautiful look in a kitchen.” Laureen Wilder, Laureen Wilder Designs, LLC.